Although Paraguay ratified the International Convention of Children’s Rights in 1990 and there has been a clear improvement in terms of human rights, the country still has a lot to do to improve the state of children so they may live in decent conditions. to raise children in good living conditions. Extreme poverty is on the rise, particularly in urban areas. This prevents underprivileged children from getting an education and healthcare necessary to their development. The schooling rate is relatively high in Paraguay, however 10% of children do not have access to the education system. This is because poor families do not have the means to pay for schooling or they choose to send their children to work rather than to study. Despite the law in Paraguay that limits the minimum age for military service to 18 years, recruitment of children and teenagers continues in the country. This is a main focus of organizations defending human rights. The military continues to appeal to poor families and encourages them to send their children and teenagers (girls and boys) to military barracks where they are trained as soldiers or forced to do chores in exchange for food. The International Labor Organization likened this practice to slavery. A military worker who recruits minors risks being suspended from his job for 5 years but this penalty has never been enforced. Statistics show that 15%, or one in four children in Paraguay between the ages of 10 and 17, work to help their families survive. Their jobs are labor intensive (market porters, car washers, criers, etc.) and don’t bring in enough money to fully feed and sustain them. Household work is very important for young girls. This prevents them from going to school regularly. 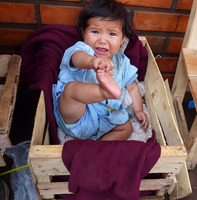 Studies of detention centers in Paraguay show serious violations of children’s rights. Aside from the fact that they are often arbitrarily arrested, some street children in prison are subjected to torture and live in degrading, cruel and inhumane conditions. In Paraguay, child abuse is still very common. In many families, parents consider corporal punishment to be a teaching method. These acts violate the International Convention of Children’s Rights, since families should be the primary protectors. Many children from poor families either decide or are forced to leave their homes to go to work and live in the streets. This situation causes children to be separated from their families and communications. Their lives are very difficult and since they have no protection they are easy prey for traffickers, who are quick to force them into prostitution or place them with families where they will be exploited. However, the government has increased measures against those who traffic children, which has resulted in a decrease in the practice. Paraguay is a victim of international trafficking since it falls in the center of Latin America. Young girls and boys are often kidnapped and exploited for sexual, commercial or domestic service reasons. They are usually sent to other countries like Spain, Italy, Brazil, Chile or Bolivia. The rate of people married before the age of 18 is 18%. Due to their traditional model, children from rural areas are married earlier than those in urban areas. These marriages can have serious consequences on children’s health since they are not psychologically prepared and they do not understand all the obligations of the union. Also, the young girls may be raped on their wedding night and victims of sexual violence afterwards.